With March Madness underway, the AAF's Week 7 wasn't exactly catching everyone's attention. However, that shouldn't be mistaken for a lack of action. Johnny Manziel made his debut on Sunday evening in a thrilling 31-25 overtime win for the Memphis Express. The only problem (at least for him)? He didn't play much of a role in it. Brandon Silvers led the Express from a 25-14 fourth-quarter deficit for the victory. Elsewhere, Orlando became the first team to secure a playoff spot, and two big wins by Arizona and San Antonio sets up a monster West division showdown in the Alamodome in Week 8. 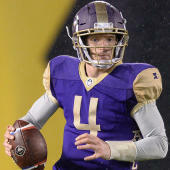 What did we learn in the AAF from this weekend? Let's get to the takeaways. On paper, it would seem appropriate that the first overtime in AAF history -- a true unicorn for the sport -- featured Johnny Manziel. And, yet, Manziel played only a small role in the 31-25 come-from-behind victory for the Memphis Express. The former Heisman winner who signed with Memphis this time last week came off the bench in the second quarter for Brandon Silvers, only to relinquish his snaps to Silvers again before the half. And though Manziel played in the second half, he again came off the field for Silvers in the fourth quarter when the Express were down 25-14. To be fair to Silvers, he earned the right to lead Memphis to its second victory of the season. That also technically keeps this team alive in the playoff race by the slimmest of margins. Silvers was the best quarterback available for Memphis and he was the one who moved the ball with any consistency. He threw the walk-off touchdown in overtime. None of this is meant to come down on Manziel. There was no realistic way he would come in one week after being signed and have an immediate impact. We're too late in the season for that, and with Memphis still playing to win football games, it will probably be at least another week before the Express would even be willing to think about going all-in on Manziel. Additionally, you have to consider that Manziel was sent to Memphis to be mentored by coach Mike Singletary. His development in all aspects is more important right now than the amount of playing time he receives. Manziel's had one big-time completion, his first, to a wide open receiver down the far side. Not that his stats matter all that much, but he finished with 48 yards passing and another 20 on the ground. Silvers gave Memphis the best chance to win and that's what they have to ride with right now. It'll be interesting to see if that changes if/when the Express are eliminated from playoff contention. The Apollos played their worst game of the season in Week 6 and it showed in a 22-17 loss to Arizona. Getting Atlanta in Week 7 was a perfect remedy. Orlando won, easily, 36-6 and got back to doing all the things that made it the best team in the AAF through the first half of the season. Quarterback Garrett Gilbert was as efficient as he's been all season, going 19-of-23 for 217 yards and a score. The running game with D'Ernest Johnson (7 carries, 54 yards), De'Veon Smith (13 carries, 40 yards, 3 TDs) and Akeem Hunt (9 carries, 39 yards) gives the offense so many options out of the backfield. And the defense came away with two interceptions, including a pick-six. The Apollos are the first team to secure a playoff spot and could get the top overall spot in the next week or two. Based off of everything so far, it would be surprising if Orlando didn't get home-field advantage for the semifinals. This is still the team to beat for the championship in Frisco, and Saturday's rout was merely a reminder of that. When this team is down, it doesn't stay down for long. The Commanders' 19-15 win over the Salt Lake Stallions wasn't a barnburner by any means, but credit San Antonio's defense for stepping up in key moments. The Commanders have taken their lumps on defense over the first half of the season, but in the past few weeks, it's been a ball hawking unit. San Antonio had two key interceptions and a pair of forced fumbles on Saturday night. The two picks absolutely played a key role in the win. The first, from defensive back Duke Thomas, stopped a Stallions drive near the goal line that could have given Salt Lake City the lead. The second interception didn't go into the box score, but it was nevertheless the play of the game. De'Vante Bausby's pick on Salt Lake City's two-point attempt not only prevented the tying score, but gave the Commanders a critical four-point lead with under two minutes remaining, which would have forced the Stallions to score another touchdown to win. Easily, this was the most game-changing play of the weekend. Stallions quarterback Josh Woodrum continues to struggle in the passing game. The Commanders will tested further in the Week 8 home game against Arizona, which has one of the top passing attacks in the entire Alliance. For now, though, this defense is playing much better. Ross has been one of the most consistent offensive playmakers in the Alliance. Heading into Week 7, he was one of only two receivers to eclipse 500 yards -- the other being Orlando's Charles Johnson. Ross also led the AAF with six receiving touchdowns. But in battling multiple injuries -- he was banged up a week ago vs. Orlando and left Sunday's 32-15 win over San Diego with a shoulder injury -- Ross has been limited lately. So it's good to know the Hotshots can spread the ball around to make up the difference. In all, a dozen different players either caught a pass or ran the ball vs. the Fleet. While Ross still led all Arizona receivers with 51 yards, most of it on a 36-yard grab, guys like Marquis Bundy and Thomas Duarte came up big with five total catches for 73 yards and a score. The Hotshots' ground game, with the added flair of complementary quarterback Trevor Knight, tallied nearly five yards per carry. Ross is a beast and when he's healthy he's one of the top two wideouts in the AAF. He's completely capable of taking over games by himself. But it has to be good for the Hotshots to know that when one of the Alliance's biggest scoring threats is hampered, other players can step up. The next-man-up philosophy is universally adopted, but rarely executed as planned.